Here are the answers to some of our most common customer questions. If you do not see the answer to your question below, feel free to email your question Here, or call us at 1-877-492-8732 or 1-519-322-4885. • How can I be sure that shopping on-line at this site is safe? • How do I know if the page is secured or not? • Do you have a sizing chart? • Do you have a sizing chart for dog jerseys? • Do you ship overseas? • Can my "ship to" address be different than my "bill to" address? • What methods of payments are accepted? • What currency will I be charged in? • What about sales tax and duty? • When is my credit card charged? • Are the items shipped identical to the pictures shown online? • What about packages lost in shipping? • That has got to be a pricing error or misprint? • How can I get on your mailing list? • Do you mail catalogues? • What do I do about damaged packages? • What are your policies on returns and exchanges? • What are your shipping charges? • What happens if I give the wrong address? • What happens if I don't pick up my package? How can I be sure that shopping on-line at this site is safe? TheSportsDen.ca uses SSL Technology (Secure Sockets Layer) to process credit card transactions. We use industry standard encryption technologies when transferring and receiving data that you exchange with our site. This same industry standard SSL Technology is used by major banks and stock brokerage firms. This encryption procedure "scrambles" the information you send to us and makes online transactions extremely safe. Despite what you have heard, it is not simple to "hack" to intercept your personal information and decode it. Billions of dollars are spent via the web every day. How do I know if the page is secured or not? There are two ways to see the security at work on this site. The first way to tell if a page is secured is in the address bar. As you will notice some pages start with the letters http:// - these are non secured pages that are only showing general information. Secured pages show https:// in the address bar; these pages are encrypted to provide the utmost in security. TheSportsDen.ca uses secured pages on any page that requires you to enter sensitive personal information, ensuring your information is secured. The second way to know if you are on a secured page is by looking at the top of your browser. Secured pages will show a lock, letting you know that the web page you are on is secure. Yes, we have a SIZING CHART AVAILABLE HERE, all measurements are approximates and are to be used as guidelines. Items being produced by different manufactures in different countries will make the garments fluctuate slightly in size. Currently TheSportsDen.ca ships with Canada Post courier service. Yes we do ship overseas but, all overseas orders must complete payment by Pay Pal. Credit card payment is not accepted for overseas orders. Can my "ship to" address be different than my "bill to" address? Yes, but please be aware that for security purposes your billing address must match that on file with your credit card company. All payments are processed using Pay Pal. We are a Canadian company and so by law have to invoice in Canadian funds. U.S. orders will be billed in Canadian funds, with the purchase price being converted back to U.S. funds by the credit card company. This amount will vary depending on the exchange rate of the credit card company. What about sales tax and duty? Orders shipped to areas outside of Canada are NOT subject to Canadian tax. It is the customer's responsibility to pay any customs, duties or taxes for any goods shipped to an international address. Any shipping charges for packages returned as a result of a customer's failure to pay customs, duties and taxes will be billed to that customer. If you purchase an item and have it shipped to a province other than the ones listed above, you might be required to self-assess PST and remit the amount in accordance with the applicable law of that province. All orders are processed immediately however, we will not charge your credit card until the order is ready to be shipped (excluding jersey customizing and special orders). We do not believe you should have to pay ahead of time for a product that is not ready to be delivered. In-stock orders ship on or before the next business day. Please keep in mind that sometimes our suppliers run out and some items may need to be special ordered which may require a delay of a few days or even weeks before we are able to ship. In this case we will e-mail you to let you know and give you an approximate arrival date. We appreciate your patience, and will fill your order as soon as we receive stock. If you prefer not to wait for a delayed item, we will happily cancel your order and refund the full purchase amount on your credit card. If the order has not yet shipped, we can change or cancel your order if you notify us. If it is a special order or a custom jersey and the process has started on these items then the order can’t be cancelled. Please review your order carefully during checkout to make sure it is accurate. If you need assistance feel free to contact us. Are the items shipped identical to the pictures shown online? We have made every effort to display products exactly as they will look when you receive them, but in some cases the manufacturer will update their graphics on a particular item and the colour shades and/or graphics may differ slightly to what we have sent you. What about packages lost in shipping? Due to the high level of fraud, our shipping policy is once an order leaves our warehouse, the shipper (Canada Post) becomes the responsible party. If your shipment is lost or damaged, we will file all paperwork necessary to start an investigation with the shipping company. We will make every effort to recover your loss for you. A replacement or refund will not be given until the investigation is complete and a claim has been issued and paid. That has got to be a pricing error or misprint? We take extra effort to ensure that our pricing and product information is accurate and up to date, but sometimes errors occur. In the event of an error in product price, availability, description or other material detail, TheSportsDen.ca reserves the right to cancel any order placed, limit quantities or substitute a substantially similar product. Prices are subject to change without notice and are limited to stock on hand. We are committed to building a loyal customer base and have created a mailing list to keep our customers' informed of upcoming promotions, special offers, new products, and new website features. To join, please e-mail us at info@thesportsden.ca. If you've ordered from us before you will already be on the list. You may choose to be removed from this list at any time. Your information will be kept by TheSportsDen.ca and not sold or given to any other companies. TheSportsDen.ca does not offer a print catalogue. We want to have as little negative impact on the planet as possible. Most products we sell are available for review on this website. We do offer more products not listed on our website at our store, but due to shipping reasons we don’t offer them on our website. We can keep up to date accuracy on our website, unlike print catalogues that can be out of date before they are even mailed to customers. If your package is damaged in any way, e-mail info@thesportsden.ca immediately after you receive it and tell us about it. Do not return the package without contacting us first and hang on to all the packaging materials as these may be required in satisfying any claim with the carrier. We will give you the necessary instructions for its return and timely replacement. The standard delivery shipping rate to most Canadian destinations (excluding Northwest Territories, Nunavut, and Yukon) is $12 for the first 2 items, and $1 for each additional item. The standard delivery shipping rate to most Continental U.S. destinations is $20 for the 1st item and $2 for each additional item. Heavy Items: Additional shipping charges for items of heavy weight or items that have an irregular shape - these items will be marked with a . If the item you are purchasing shows a there will be an additional charge of $10.00 per item for most Canadian destinations (excluding Northwest Territories, Nunavut, and Yukon), $25.00 per item for most Continental U.S. destinations. Some destinations in Canada and the United Sates we are unable to ship regular or heavy items. TheSportsDen.ca does not profit from the shipping fee charged and in fact, we absorb a 10-15% loss overall via this method. What happens if I give the wrong address? The Sports Den is not responsible for incomplete or incorrect addresses. This includes but not limited to apartment numbers, unit numbers, PO Box, and Rural Routes. Our shipping labels are printed directly from the information inputted by the customer during the checkout process on The Sports Den website and not Pay Pal. If your order is not delivered due to an incomplete or incorrect address the customer is responsible for charges incurred from the courier to return the package to The Sports Den. Please note that the initial Shipping Charges WILL NOT be reimbursed. If the customer chooses to have the order re-sent our standard shipping charges will apply. Upon receipt of your merchandise, TheSportsDen.ca will refund your payment. E-Commerce payments will be credited directly to the credit card account or Pay Pal account used for the transaction. Please note that the initial Shipping Charges WILL NOT be reimbursed. Any new Shipping Charges incurred from the courier to return the package to The Sports Den will be charged to the customer. If the customer chooses to have the order re-sent our standard shipping charges will apply. If you would like to have a professionally customized jersey by TheSportsDen.ca, simply locate the jersey you want customized, click on "YES" under the PRO CUSTOMIZATION heading and fill in all your customizing info in the boxes provided and click "ADD TO CART." Please allow a minimum of 2-3 weeks for any jersey customizing. If you have any questions about customizing your jersey, please e-mail us at info@thesportsden.ca . VERY IMPORTANT: Please review your order carefully during checkout to make sure it is accurate because customized jerseys are NON-RETURNABLE, AND NON-REFUNDABLE. Use these charts to help determine which jersey size will fit you best. Child (4-7) 21" 22 1/2" 17 1/4"
Toddler (2-4) 18 1/4" 19" 14 1/8"
Infant (12-24 months) 13" 14 3/4" 12 1/2"
Use these charts to help determine which jersey size will fit you best. All measurements are in inches. Chest 32"-34" 36"-38" 40"-42" 44"-46" 48"-50" 52"-54" 56"-58" 60"-62"
Waist 24"-26" 28"-30" 32"-34" 36"-38" 40"-42" 42"-44" 44"-46" 46"-48"
Chest 32"-34" 34"-36" 36"-38" 38"-40" 42"-44" 46"-48"
Waist 21"-23" 23"-25" 26"-28" 30"-32" 34"-36"
Hips 31"-33" 33"-35" 36"-38" 40"-42" 44"-46"
Waist 21"-23" 25"-27" 29"-31" 33"-35" 37"-39" 40"-42"
Jersey Size 46" 48" 50" 52" 54" 56" 58" 60"
Chest 42" 46" 50" 54" 58" 62" 66" 70"
Body Length (front) 30" 31" 32" 33" 34" 35" 36" 37"
Body Length (back) 32" 33" 34" 35" 36" 37" 38" 39"
Chest 26"-28" 30"-32" 34"-36" 38"-40"
Neck 8 3/4" 8 7/8" 8 7/8" 9 1/8" 9 1/4" 9 3/8" 9 1/2" 9 3/8"
Armhole 11 1/2" 12 1/8" 12 3/4" 13 3/8" 14" 14 5/8" 15 1/4" 15 7/8"
Width 20 1/2" 22" 23 1/2" 25" 26 1/2" 28" 29 1/2" 31"
Length 31 3/4" 32 7/8" 34" 35 1/8" 36 1/4" 37 3/8" 38 1/2" 39 5/8"
Neck 8" 8 1/2" 9" 9" 9 1/2" 10" 10 1/2"
Armhole 11 1/4" 11 3/4" 12 1/4" 12 3/4" 13 1/4" 13 3/4" 14 1/4"
Width 20" 22" 24" 26" 28" 30" 32"
Length 31" 32" 33" 34" 35" 36" 37"
Use these charts to help determine which size will fit you best. All measurements are in inches. Neck 14"-14.5" 15"-15.5" 16"16.5" 17"-17.5" 18"-18.5"
Regular Sleeve 32"-33" 33"-34" 34"-35" 35"-36" 36"-37"
Tall Sleeve 33"-34" 34"-35" 35"-36" 36"-37" 37"-38"
Waist 29"-31" 32"-34" 34"-36" 36"-38" 38"-40"
Bust 30"-32" 32"-34" 34"-36" 38"-40" 40"-42"
Waist 22"-24" 24"-26" 27"-29" 29"-31" 32"-34"
Hips 32"-35" 35"-37" 37"-39" 40"-42" 42"-44"
Use these charts to help determine which size will fit you best. Height (in) up to 24" 24.5"-27" 27.5"-29" 29.5"-31" 31.5"-33" 33.5"-35.5"
Height (in) 33"-36" 36"-39" 39"-42"
Height (in) 39"-41.5" 42"-44.5" 45"-47.5"
Height (in) 40"-42.5" 43"-45.5" 46"-47.5"
Height (in) 51"-53" 55"-57.5" 58"-60" 60.5"-63"
Height (in) 50" 54"-58" 61"-64" 66"-68"
Measure you dog from base of the neck to base of the tail. Dogs apparel comes in limited size ranges and there is a significant difference between size of apparel. 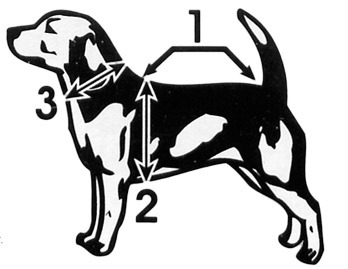 Because of this, we suggest measuring your dog following the size chart provided. The item may be larger or smaller fitting on your dog depending where on the size range they fall. Never assume that because you have a large dog they will take a large size - you must measure. We go by length, girth and neck. If you do not have a soft or fabric style tape measure, use a length of string or yarn and mark it as you measure your dog, then lay that string against a yardstick to determine the inches. If your dog is stouter, has a thick coat, broader check, wider underside or is at the maximum for the size chart listed, you may want to move up to the next larger size for an optimal fit. Please note the largest size range listed for each size as you consider the best overall fit. Small - 12" - 13" Medium - 14" - 15" Large - 16" - 17" X - Large - 18" - 20"